Fast, cheap, and out of control—app-activated and undeniably fun electric scooters hit Cincinnati streets this summer. Without so much as a heads-up to city leaders, Bird swooped into downtown and OTR in July, followed by Lime in September. People were suddenly scooting everywhere, showing there’s an untapped demand for new ways to get around town, especially for that first and last mile of longer trips. Between your parking space and office, for example, or from a Cincinnati Bell Connector stop to lunch or dinner. Download the app, and for $1 plus 15 cents per minute you’re gliding through traffic. Drop the kickstand at your destination, lock the scooter with the app, and you’re finished. No sweat (except the terror of getting run over at intersections). As in other cities that saw unannounced rollouts by California-based high-tech transit startups, the scooters’ sudden appearance disconcerted and rankled some who see their sheer numbers and sidewalk use as a threat to public safety. But most, including Mayor John Cranley, hailed their arrival as a sign of downtown’s vibrancy and called for regulations to keep them safe. City leaders scrambled to draft interim agreements with both companies that include indemnity clauses and insurance requirements. They outlawed scooting on sidewalks, which now comes with a $100 fine (for both the rider and the company), and capped the number of scooters for each company at 200. Bird has already asked for more. While the scooter apps’ end user agreements make you sign off on the rules, enforcement is another matter. Almost daily, under-18, tandem, sans-helmet sidewalk-scooting riders can be seen violating four of the rules simultaneously. But the scooters’ ridership is also strikingly diverse, encompassing men and women, old and young, professional and un-. Per their agreements with the city, both companies must share anonymized data with the city; Lime has provided a dashboard displaying trip trends and heat maps, a potential gold mine to planners making decisions about the transit grid with which the scooters mesh. “The city supports first-mile, last-mile safe transportation alternatives,” says City Director of Communications Casey Weldon. “Big picture, the more options people have to get around, the better off you are in terms of choice that fits your lifestyle,” says Chamber of Commerce Transportation Policy and Coalition Manager Pete Metz. Jason Barron, executive director of the community-supported, nonprofit bike share Red Bike, which turned four in September, welcomes the scooters. Red Bike’s rider numbers are up since the scooters arrived, he says. “A lot of the folks on the scooters aren’t necessarily the folks that want to be on Red Bike,” he says. “It’s just not their thing.” A keen observer of national trends, Barron says the success of any new transit concept depends on matching its model with each city’s scale. And community support, he says, is the ultimate deciding factor. West-coast transit startups aren’t the only ones stepping in to give Cincinnatians a lift. Bengals cheerleader Lauren Dye and her husband Patrick started Gest Carts. 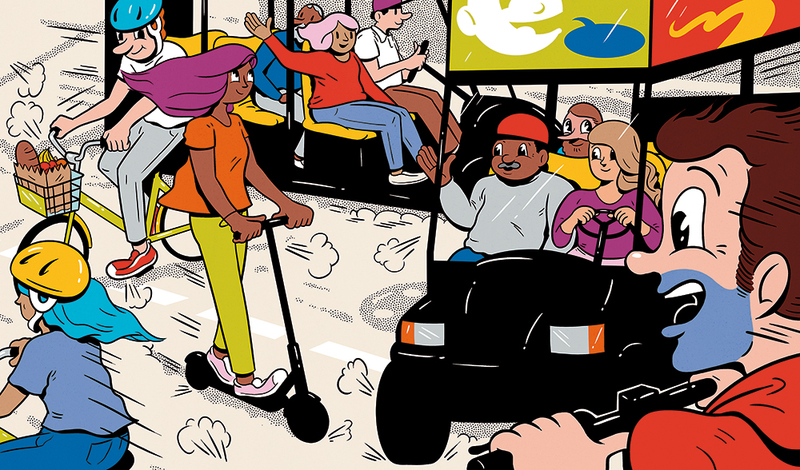 Their fleet of 12 plus-size electric golf carts carries advertising, making Gest Carts free to ride, although drivers work for tips. “The streetcar stops outside of The Banks [on Second Street],” Patrick Dye says. “But we actually can go inside.” The 25-mile-per hour vehicles don’t run close to rush hour (from 2 to 6 p.m.), and there’s no app required. “[What] we want to be is a rapport-based business,” he says. “The big thing for us is we don’t have a set route, so if a person wants to go to a parking lot, they call us.” Gest Carts aren’t the only local business riding the “microtransit” wave. In October, the Business Courier announced the soft launch of the Cincinnati-born, free Oggo ride service: a fleet of five-seat vehicles that are ordered up when and where the need arises, via app. Their electric vehicles even sport tablets showing dining and entertainment options. Liberty Hill resident Noel Prows is a local transit power-user, hopping on the streetcar, bus, Red Bike, and scooters interchangeably. He likens the arrival of these new tech-based transportation offerings to Uber and Lyft. “It’s the gig economy,” he says. Whatever the future has in store for Cincinnati, it’s safe to say that as long as our mass transit systems remain strapped for cash and emerging permit-based parking plans put a premium on places to stash your car, demand for new transit modes will grow. And where there’s demand, smart entrepreneurs will keep figuring out new supply ideas for the future.